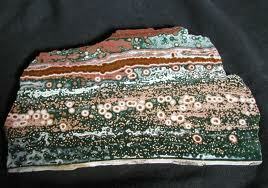 Ocean Jasper is a silicon dioxide mineral that occurs in highly silicified rhyolite. 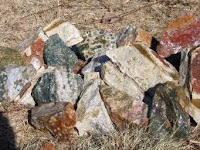 This means that it is in the Quartz family and just like all other Jaspers it has a hardness of 6.5 to 7. Ocean Jasper is sometimes called Orbicular Jasper, a broad term given to several Jaspers displaying perfect circles throughout the piece. The peculiar orbs or "bull's eye" patterns are caused when Quartz and feldspar crystallize in radial aggregates of needle shaped crystals. A few of these other Orbicular Jaspers are Poppy Jasper and Leopard Skin Jasper. Many of these other orbicular jaspers are found in various locations throughout the world; however none are as rare as Ocean Jasper! The vibrant colors visible in Ocean Jasper are caused by many different minerals. 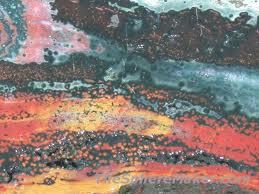 Red is caused by iron or hematite, light yellow or gray is caused by clay and brown or deep yellow is from goethite. Sometimes a dazzling display of sparkling tiny crystals occurs upon the surface. These little gems, known as druze, are the result of clear or white quartz formations. Many collectors seek specimens of Ocean Jasper with these unique crystals upon them. Another exceptional quality of Ocean Jasper is translucency. Many specimens are opaque and still very beautiful while others, when held in front of a strong light source, display what can only be described as another world! When viewed in front of a bright light the translucent or clear background illuminates and displays the contrasting solid orbs, which then reveal exactly why Ocean Jasper is sometimes called "Fish Eye Jasper". These solid spheres appear suspended in the illuminated quartz. Each piece of Ocean Jasper seems to have a mind of its own! For example, in some specimens a solid opaque background of mustard yellow contrasts with hundreds of tiny green circles. In others, a sparkling white surface displays diagonal lines of pink and red running in every direction. 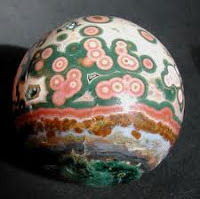 Almost every piece of Ocean Jasper displays at least one of the orbs, striking colors, crystal displays or translucency. The story of Ocean Jasper began many years ago. It was the early 1950's in Madagascar when a prospector brought Paul Obeniche of Madagascar Minerals Co. a sample of the curious new orbicular jasper. The prospector could not recall the source of the sample, however Paul estimated it may have been from the northwest coast of Madagascar. Reaching this particular location was extremely dangerous due to treacherous reefs, sheer rugged cliffs and no roads. The effort to find it was fruitless and this new Orbicular Jasper was soon forgotten. 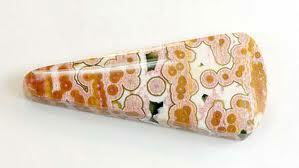 About 45 years later, photos of this unnamed Jasper reappeared in the Mineralogical Encyclopedia. This sparked everyone's curiosity and the Madagascar Mineral Company sent out several expeditions again. In 1999, after 45 days of visiting fishing villages along Madagascar's NW coast, the Orbicular Jasper was once again discovered! Luckily the expedition was sailing near Moravato, along the NW coast during low tide. As the strong ocean currents pushed back from the cliffs, the beautiful Orbicular Jasper was seen once again!